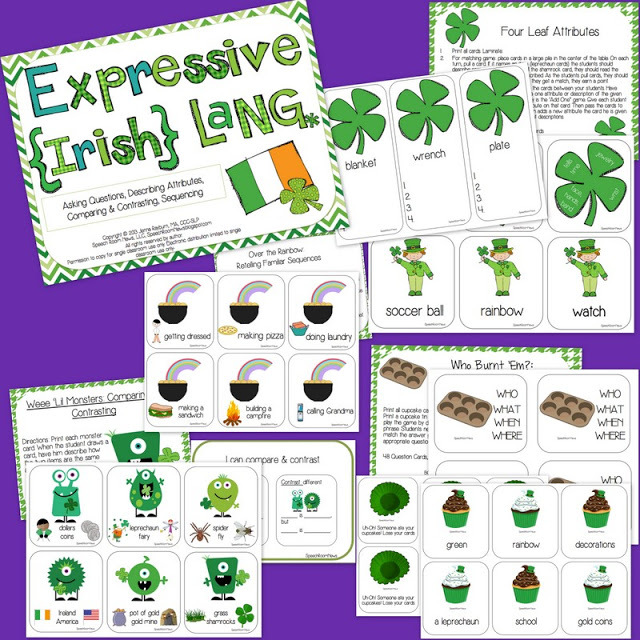 Expressive Language for St. Patty! I feel like I’ve been working on this packet forever! 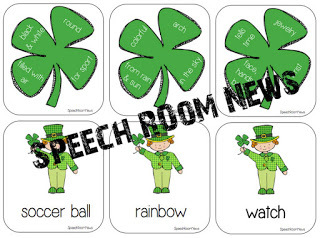 So I’m happy to introduce my Expressive Language activities with the St. Patty’s theme. If you haven’t used my activities before, let me explain a little! 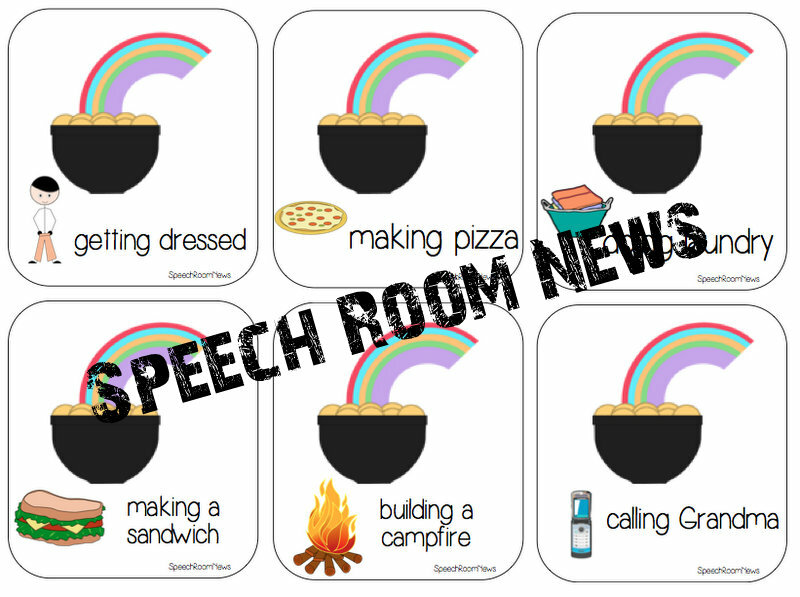 I create a few packets full of activities that I can adapt and use with almost all of my k-5 students. This is my ‘lesson planning’ for the month of March (with the receptive/grammar packets!) I hope they save you time and energy if you need them! The packet is 41 pages featuring 4 activities: Asking Questions, Comparing & Contrasting, Retelling Familiar Sequences and Attributes/Describing. Developed for use in speech therapy by speech-language pathologist. THis packet is also great for literacy center and parents working on carryover. Who Burnt ‘Em? : Asking Questions: (48 cards) Students play the game by drawing the cards. Each contains an answer. The students need to develop an appropriate question to match that answer. If they answer correctly the students keep their card. Watch out for special cards! Weee ‘Lil Monsters: Comparing & Contrasting (24 cards) Print each robot card. When students draw a card, have them describe how the two items are the same and how they are different. 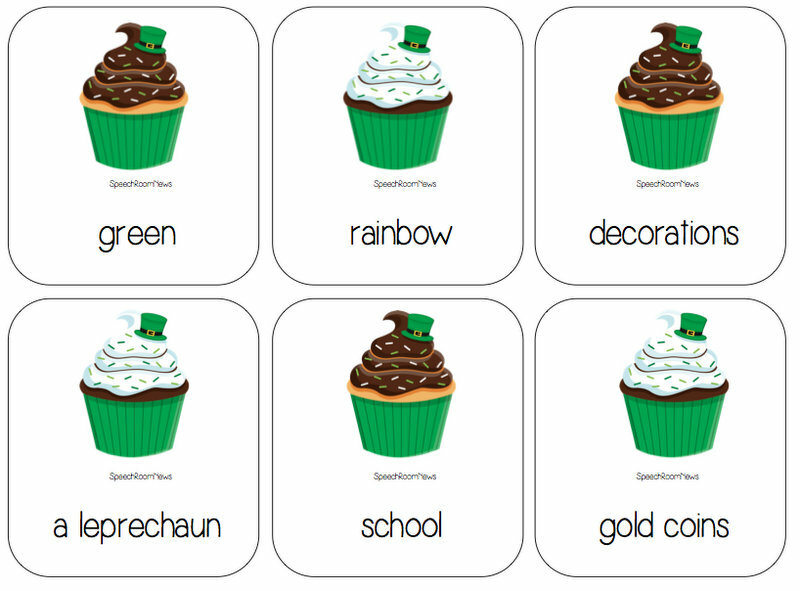 Over the Rainbow: Retelling Familiar Sequences: (24 cards)Students pull a sequencing card. Read the card and identify the steps to complete the sequence. 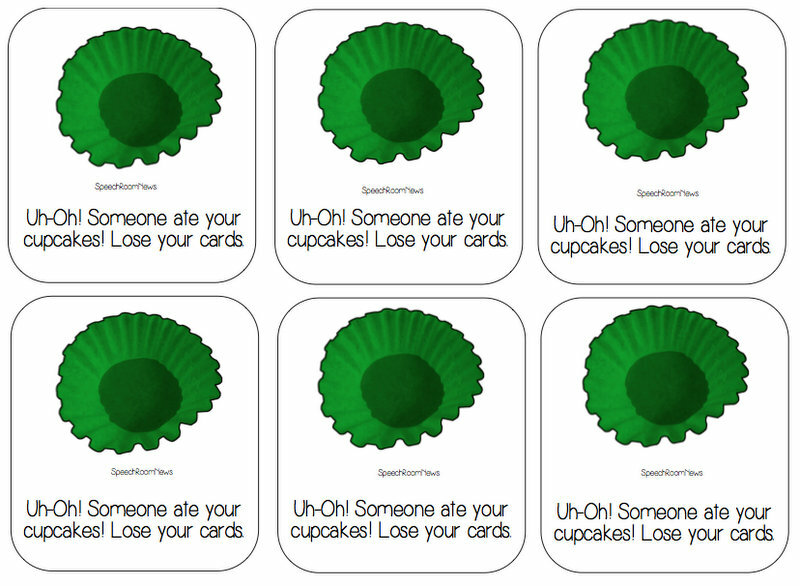 If they retell the sequence correctly they may keep the card. If they keep it, they can store it on their leprechaun mat Four Leaf Attributes: (30 matching, 15 expressive cards) Use the matching and expressive cards to describe the given objects. 3 ways to play included! 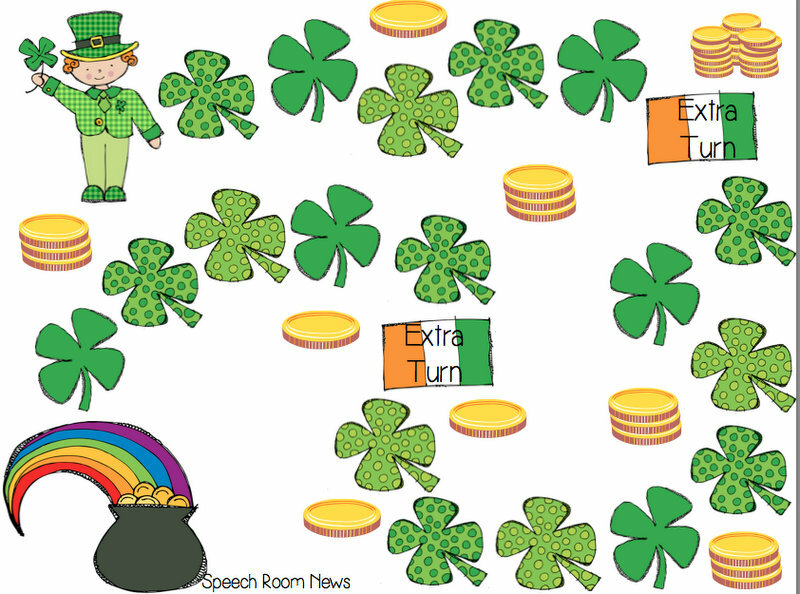 St. Patty Board Game: Use this game board as an accompaniment to any activity included in the set. You can find it in my Teachers Pay Teacher store. Leave a comment below and I’ll pick a random winner to get a free copy! I love your blog! You always come up with great ideas. Thanks for sharing! You have so many great activities! Love your packets. Perfect solution for saving some time with planning! Very fun and functional, looks great! Great selection of activities! Love that you have included both graphics and pictures (when appropriate) for stimulus items. Love these packets so much! I could use this with most of the kids on my caseload! Can it be march now? I love the detail you put into your packets and your work in general. It is so helpful that many of the material can target multiple IEP goals. I love these and so do the kids i work with ! Another great activity. 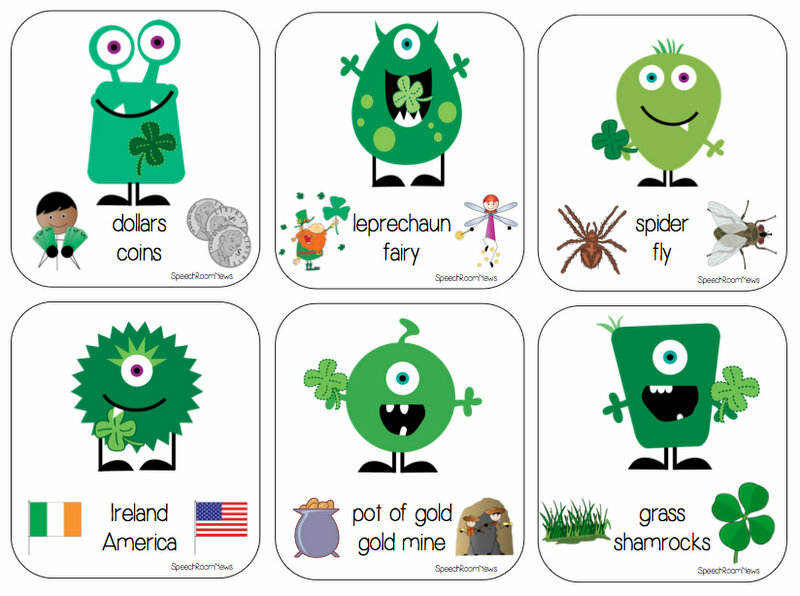 I especially like the attribute 4 leaf clovers with the examples. I use your activities in therapy often! I love your activities and so do my students! I love your expressive and receptive language packets! Hope I win! This looks great! I especially love the describing and attributes activity! I love all of these activities, especially the ones for asking questions and for describing. My students have such a tough time with those skills. These will be perfect! This is awesome! 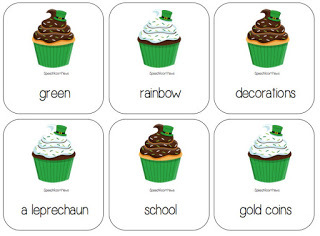 I was trying to figure out what I was going to do with my kiddos this St. Patty’s Day! We just finished up The Mitten packet and the kiddos LOVED it 🙂 Thanks so much for what you do! Looks like another great packet! My students have enjoyed all of the activities in the other packets I have. This is another great packet. 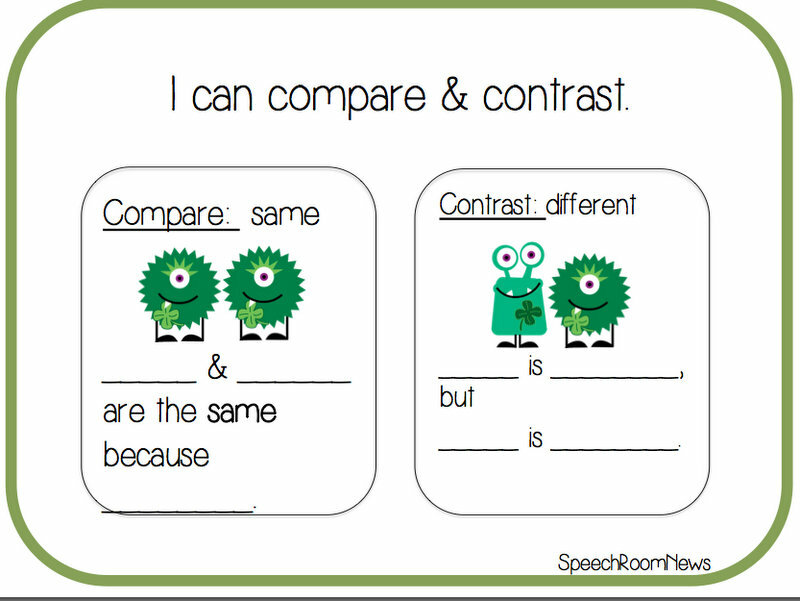 I have several students in grades 2, 3 and 4 who are working on compare and contrast and I feel I never have enough options for them. It’s so nice to also have a board game to go with the pack! I love this. It would work well for my lower level middle school students. Keep up the good work! St Patty’s is always a fun theme! nice packet! Super cute! I could see using this with a really wide variety of clients! Thank you! The activities target so many skills at once. Well done! Love all St. Patrick’s materials! We celebrate it big in my room! I love these comprehensive packets, makes planning easy and therapy fun. Looks great! I need some more activities for comparing and contrasting, and I always love your themed packs. Nobody better dare eat my cupcakes! lol Those sim/diff monsters are adorable! What a great pack! Looks like another great activity for my students! They love your theme packets! Thanks for sharing! Love this! Makes for such easy lesson planning!! I love your expressive and receptive packets. Even though you develop them for K-5 I can adapt the packets for my older kiddos and they love them. Looks like fun!! I have a monster theme in my therapy room so my kids would get a kick out of those, especially. Thanks for cute activities! Your packets are FABULOUS! Everything I need for a theme or season is right there! Thank you for making my life easier!! Adorable clip art. Hope I win. Love your activities, I use them all the time! I love the graphics you used in this packet, so cute! – Courtney P.
Totally cute! I would love a copy! Would love to win this! Looks so cute! 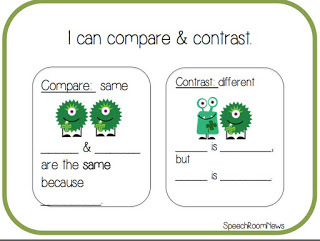 I love the compare/contrast and attributes activities! 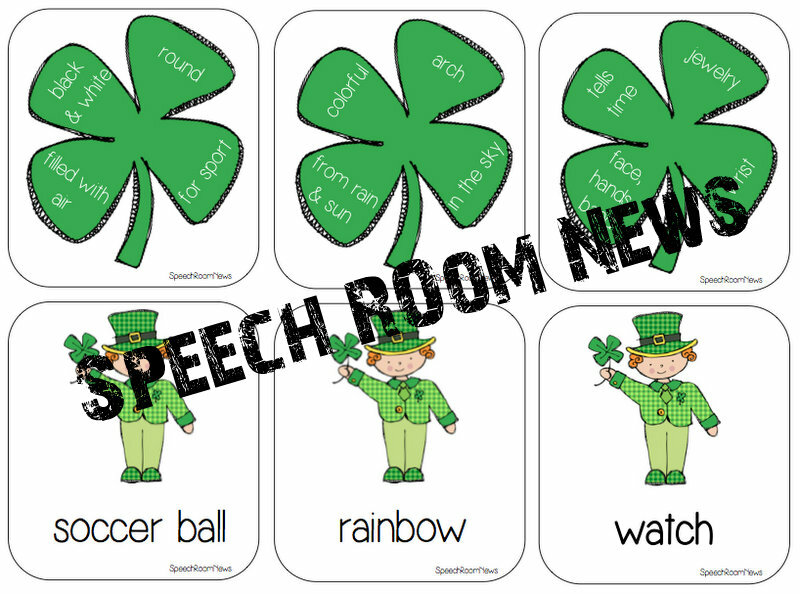 Those are especially hard for my students so I would love something new and exciting to give them in March! 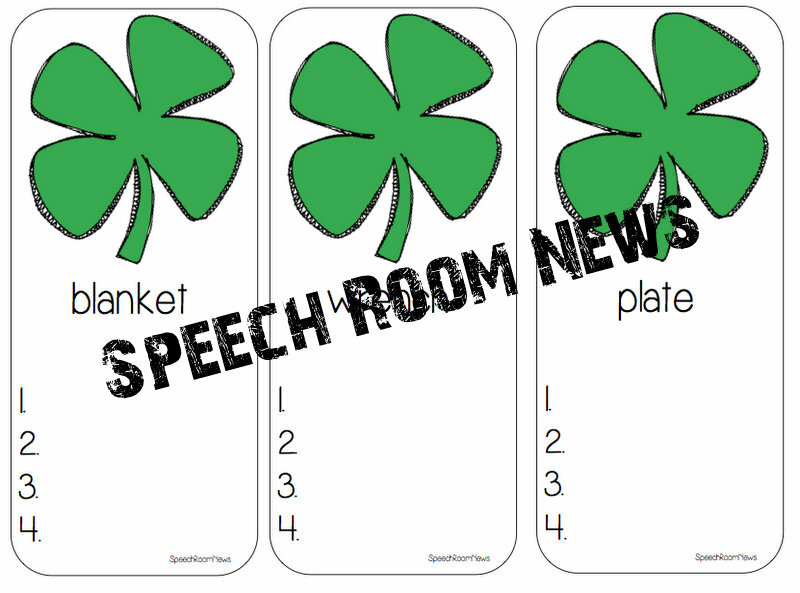 This Irish Speech Path would love to win this! My clients look forward to these holiday themed packets! I love having a variety of materials to address goals I work on frequently! Thanks Jenna! What a fabulous packet for March! Can’t wait to incorporate some clovers into my daily therapy sessions!! Thanks for posting!! I would love to get a free copy of this packet! 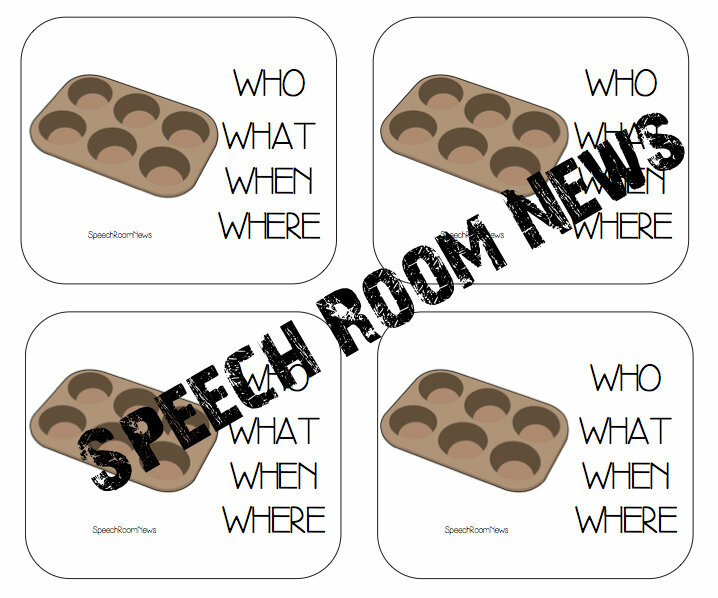 Its so useful and can be used to work on some many receptive, expressive, and verbal reasoning goals. 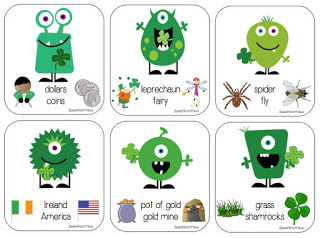 My Irish eyes would be smilin’ ear to ear if I had this pack! I love your creative ideas! I wish I could be this creative! Thanks so much for sharing your wonderful ideas with the rest of us! I hope I win this so we can have FUN! FUN! FUN! in speech! I am new to this site and absolutely love it. You have really inspired me!! Congrats! You’re my random winner Ann! This looks like such a fun March packet! You are awesome Jena. You have very cool stuff. I am your new follower! Another wonderful packet! Thank you for the opportunity to win! I love the activities you create. 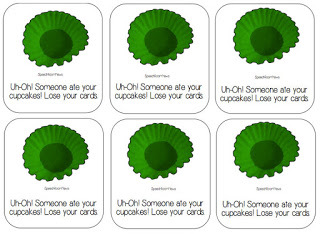 I have been enjoying using them with my kids. Looks like a great packet and it will go well with the grammar packet I already purchased! Learned about you on another site- great ideas. This is amazing! Would love to win it! Wow! Check out all the comments! You go girl!!!! Anyway, I love your activities and this would be an excellent addition to my growing assortment of therapy activities. Thanks for everything! My kids love all of your activities! This one looks great! Wow this is great! Your themes units are great! Another great packet! Your energy and creativity levels are astounding. I’d love to win this to use with my students – so many different activities to hit various IEP goals. Love the activities in this packet! Very creative!